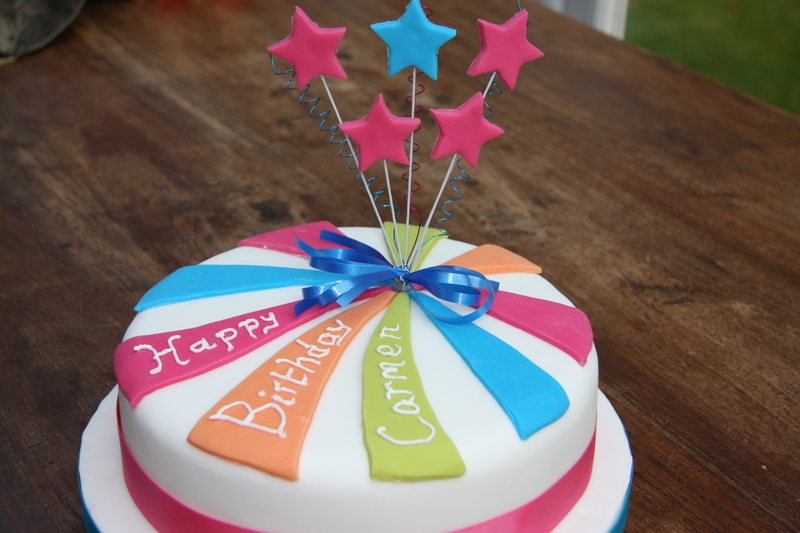 Home › Baking › Disco Birthday Cakes – seeing double! 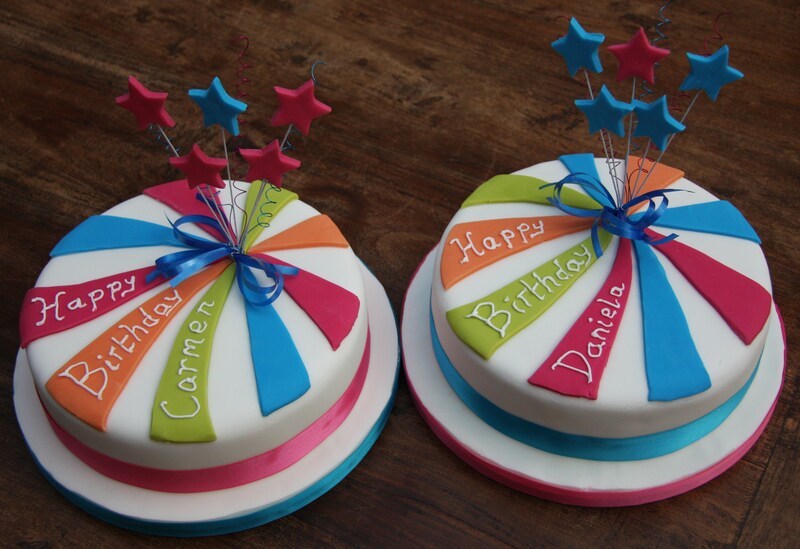 Disco Birthday Cakes – seeing double! I mention my lovely friends a lot on this blog and this post is no exception! Children’s birthday parties get more exciting by the day – I don’t remember going to a disco when I was 8 but my friend’s twin girls wanted a disco party for their birthday. And of course a birthday means cake; and a disco party means disco cake! I was really pleased to be asked to make some cakes for the twins on a “disco” theme so I had a quick look at the internet for inspiration. Disco apparently conjures two main images – glitterballs and silhouettes of people dancing in flares. I wasn’t convinced that the average 7 and 8 year old would really appreciate those, so went with the swirly bright colours that were also a popular choice. The girls initially thought they might like one chocolate and one vanilla cake. When I asked their mother who would like which, the message that came back was that actually they would like two vanilla cakes. I would have loved to have been there for that conversation! So in the end they each had a three layer vanilla sponge, sandwiched with jam and buttercream and iced with sugarpaste. I made a template of the top of the cake from greaseproof paper and drew lines with a ruler in the pattern I had decided on. 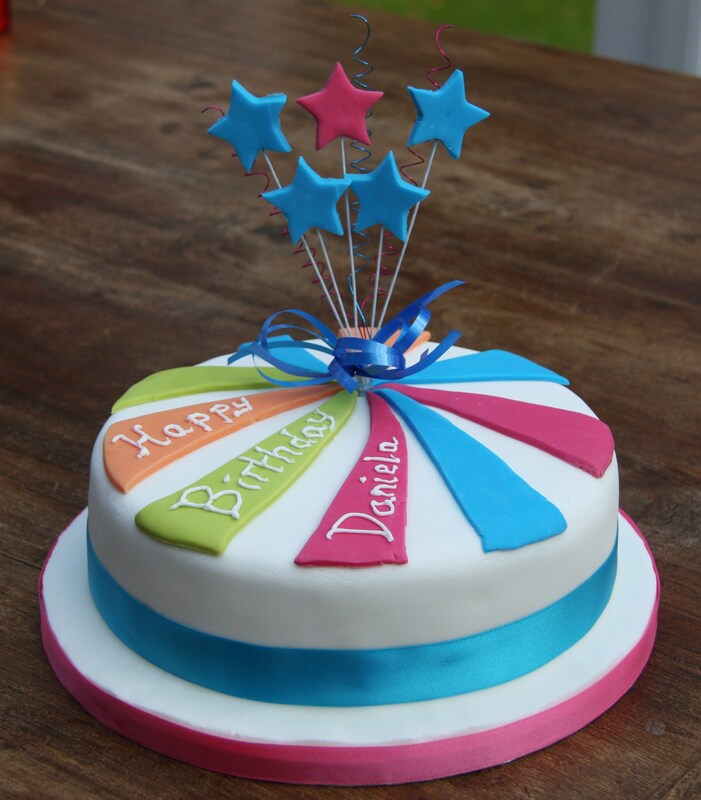 I then used it to make sure that the coloured pieces were shaped to fit the cake and swirled them slightly when I put them on the top. I made the stars with sugarpaste and floristry wire and left them to dry before taping them together and adding some twirls and ribbons to the bouquet. The swirls lent themselves perfectly to a birthday message. So Happy 8th Birthday to Carmen and Daniela and thank you for letting me make your cakes! And as no birthday can really be complete without a chocolate cake, and as their friends had eaten all their party cake, for their actual birthday Magda asked me to make them a little chocolate cake each. I’ll be posting those soon!